Low serum vitamin A levels were seen in 63 percent of 474 pregnant women in Malawi. Infant mortality was directly associated with maternal serum vitamin A levels. In a cohort of 133 HIV-infected mothers in the Baltimore area, the risk of perinatal transmission of HIV was associated with maternal vitamin A deficiency. Sixteen percent of transmitters and 5 percent of non-transmitters were severely vitamin A deficient. Vitamin A-deficient mothers were 3.69 times more likely to transmit the virus to their children. Research at Memorial Sloan Kettering Cancer Center in New York has confirmed maternal vitamin A deficiency as a risk factor for transmission of HIV. Seventy percent of children born to HIV+ mothers were vitamin A-deficient compared to age-matched controls as early as the first few months of life, regardless of the child's HIV status. Approximately 25 percent of this pediatric population was found to have growth or developmental delays. A randomized, double-blinded trial in Durban, South Africa, evaluated the effect of 5,000 IU retinyl palmitate and 30 mg beta carotene daily during the third trimester of pregnancy, and 200,000 IU at birth in HIV-positive mothers. Women receiving the supplements were less likely to have a pre-term birth (11.4% with vitamin A and 17.4% with placebo; p=0.03). Of the 80 pre-term deliveries, those who received vitamin A were less likely to transmit the virus (17.9% on vitamin A vs. 33.8% on placebo). A randomized, placebo-controlled trial of vitamin A in children of HIV-positive mothers in Durban evaluated the use of age-adjusted doses of vitamin A. Children received a single dose at one and three months (50,000 IU), six and nine months (100,000 IU), and 12 and 15 months (200,000 IU). At follow-up (16 months), the supplemented group had 28 percent less diarrhea, 40 percent less prolonged bouts of diarrhea, and a 77-percent reduction in hospitalization for diarrhea. A multivariate analysis at the end of the trial suggested the therapeutic benefit was actually seen in the children who had contracted HIV and were later diagnosed HIV seropositive. Regardless of the methodological issues of measuring zinc bioavailability, studies looking at zinc supplementation in HIV/AIDS have proven useful. 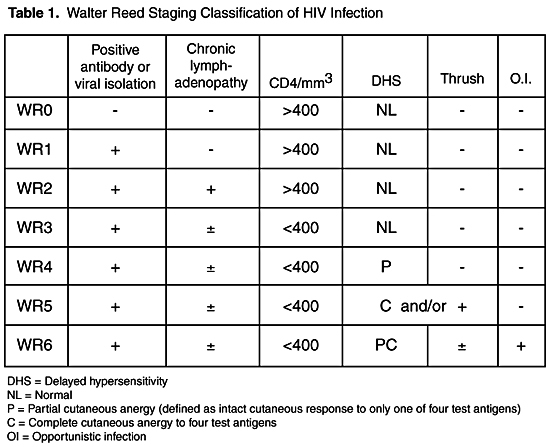 Isa  evaluated 11 men with AIDS who were classified as Stage 5 according to Walter Reed classification (see Table 1). Before zinc supplementation, serum and blood cell zinc levels did not differ significantly from controls. After 10 weeks' supplementation with oral zinc sulfate, providing 0.45mg/kg/day of elemental zinc, there was a significant (p<0.05) increase in mean CD4+ cells (from 280 to 390/mm3). Absolute counts of CD3+ lymphocytes also rose significantly. During supplementation, all patients exhibited progressive weight gain, with a mean increase of seven pounds(p<0.001), which could not be accounted for by increased calorie intake. Mocchegiani  followed 18 HIV+ patients with CD4+ of 250-400/mm3 on anti-viral medication (AZT alone) who were supplemented with 12 mg elemental zinc daily for 30 days, and found the relative risk for opportunistic infection was significantly higher in the unsupplemented group on AZT. In 28 HIV+ patients on HAART (two nucleoside analogues and a protease inhibitor) who were supplemented with the same zinc protocol, no significant risk for opportunistic infections was found in the zinc-unsupplemented HAART group. There was an inverse correlation between serum zinc levels and HIV-RNA (viral load) in both groups. This researcher also observed that triple anti-viral therapy improved zinc absorption and serum zinc levels. Theoretically, zinc absorption might have improved as a result of the anti-inflammatory effect on the gut of a lowered viral load.